Oley Ravioli is more than just a catchy name. Although a pasta kitchen on their property was the original plan, the availability of a stand at the market seemed like an exciting option. The couple located exclusive pasta machinery made by Arcobaleno Pasta Machines LLC, Lancaster, and received onsite training in all things pasta at the manufacturing facility.”They’re the sole manufacturer of this type of machinery in North America,” Chrusciel said, noting that most pasta equipment comes from Italy.The process is simple, he said. With only three ingredients – flour, water and olive oil – nine shapes of pasta can be made from the Oley Ravioli extruding machine. The filling machine completes the recipe.”You can do what you want with the fillings,” Chrusciel said. “You can be super creative.”Customers of Oley Ravioli can choose from four types of pierogies: bacon cheddar potato; homemade potato filling created with the traditional filling recipe used by Marino’s mother; sauerkraut and potato; and farmer’s cheese and potato, using mild, traditional pierogi cheese sourced from Mount Carmel, Northumberland County. Not only are there pasta sauces, including traditional red, pesto, cheese and scampi to choose from, but pasta choices abound at Oley Ravioli. Fans of the Renninger’s stand include Marty and Beverly Schmittberger, Lower Alsace Township, who love the traditional ravioli with red sauce, as well as the seasonal pumpkin ravioli with cranberry whiskey sauce.”It’s subtle,” Beverly Schmittberger said of the pumpkin flavor. “They really give you good instructions,” she said, describing the option to take home cold pasta to cook fresh.”Everything is homemade,” said Marty Schmittberger. “It’s not pre-cooked. We’re regulars here. We really like the food.”Oley Ravioli’s menu is eat-in or take-out, and customers can choose to snack on a walk-around bowl while shopping at the market, dine on a platter at the counter or take home pasta and pierogies to warm after a long day.Chrusciel said two-thirds of food sales at Oley Ravioli are to customers who cook their pasta and pierogies at home. When Chrusciel and Marino acquired the market stand in February, it was nothing but bare bones. “The only thing that was in the stand when we moved in here was the sink,” Chrusciel said. “It took four months to get things licensed and approved.”A July opening came after the Oley Ravioli kitchen was designed to accommodate the pasta machinery and incorporate an industrial range hood.The eight-member staff, including retired chef Ernie Stancick of Oley Township, do weekly preparations of all the fresh ravioli and pierogi fillings, sauces and pasta, as well as packaged food for pickup.”Business is good,” said Chrusciel. 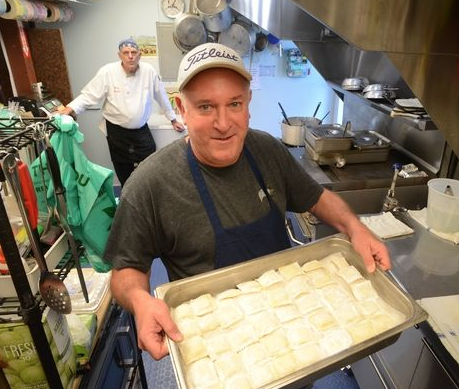 “We’re selling out the case every weekend.”In addition to the busy days at the market, Oley Ravioli also takes orders for parties, fundraisers and caterers, and is hoping to expand its services to local restaurants. If you’re in the area on a Friday or Saturday, makes sure you stop by Renninger’s Antique and Farmer’s Market to visit Oley Ravioli! Renninger’s Antique and Farmers’ Market, 740 Noble St., Maxatawny Township. 484-507-2239 | Fridays, 10 a.m. to 7 p.m. and Saturdays, 8 a.m. to 4 p.m.